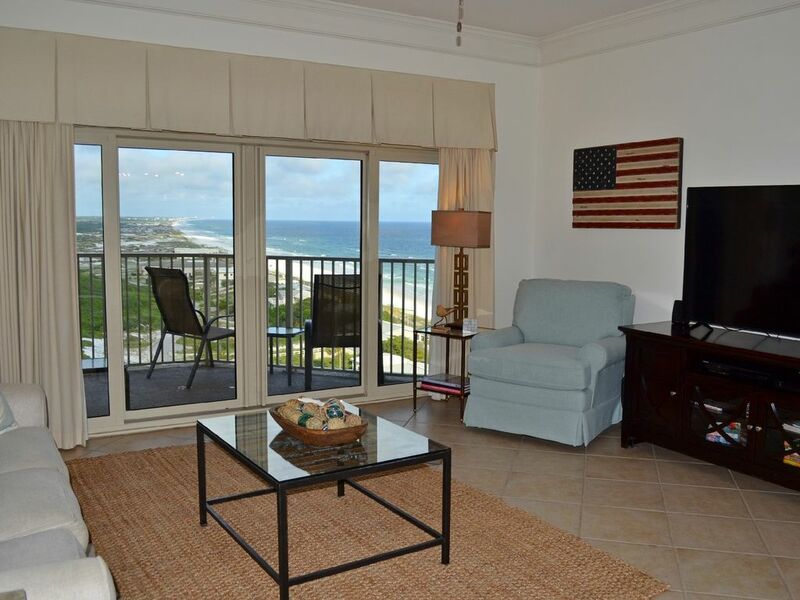 Gorgeous beach condo~relax & have no worries - we'll take care of the rest! Tops'l's Beach Manor 1206 is one of our favorite units in the building and is one of our guest's favorites too as it always books up quickly for the season. You are greeted by a remodeled, spacious kitchen and dining area which opens up to the warm blues and greens of the Gulf waters. The kitchen is fully stocked with all the basics that you need for a delicious dinner indoors. Welcome the salty beach air by relaxing in your beachfront living room or watch your favorite sport's team on the huge living room TV (also has surround sound!) The couch folds out to sleep 2 additional guests. This unit has such a special feature of being able to take in the spectacular views of the Gulf of Mexico and the Tops'l Wildlife Preserve - without all the high rise buildings. You can also look North to the calm bay waters. You will find custom glazed cabinetry, unique artwork, new electronics, and custom drapes. You will also find a washer/dryer in the kitchen area in case you need to run a load of laundry or two. The master suite has a king-size bed, floor-to-ceiling windows, and even an entrance to the balcony! A large private master bathroom is perfect with a shower and double vanity. The guest bedroom offers two twin-size bed and access to the guest bathroom. The addition of the queen sofa sleeper in the living area allows this condo to sleep six people comfortably. Free parking. Absolutely NO boats, trailers, or 2 wheeled vehicles (per the Resort). Parking limitations exist. Contact GBR office for details. GBR Featured Partner offers GBR guests discounted rates with drop off and pick up services. *Daily maid service is an option and is available upon request for an extra fee.